On March 27th, 1776 Captain Juan Bautista de Anza and his advance party of soldiers ended their nine-month, 900-mile trek from Mexico here at Mountain Lake where they became the first non-natives to walk the San Francisco Bay. Anza and his men chose this spot to rest because it was one of the few natural lakes in the area and a source of fresh water. The Spaniards camped here for two days and laid the groundwork for a settlement that would grow into the city of San Francisco. Three months later, Anza's main party of 193 settlers arrived and staked out the Presidio, half a mile away. For the next 46 years this would be the northernmost outpost of Spain's empire on the Pacific Coast. Many locals have not seen Mountain Lake although they have certainly driven by the historic spot. 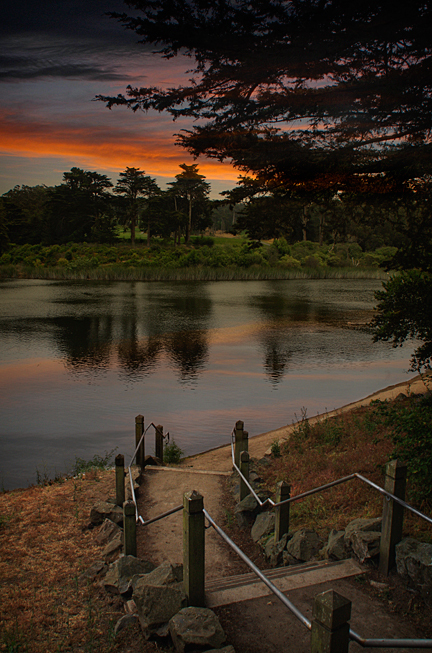 The lake is located just off Park Presidio Boulevard at Lake Street, in the Inner Richmond District. Mountain Lake sits on the southern edge of the Presidio Golf Course, near the MacArthur Tunnel, and features hiking trails as well as a children's playground. TRIVIA QUESTION: What unusual thing was discovered in Mountain Lake in 1996?